Pictures & images of Carreg Sampson or Sampson’s Stone Neolithic burial dolmen, near Abercastle on the Pembrokeshire Coast Path in Wales. Carreg Sampson is a 5000 year old Neolithic dolmen located half a mile west of Abercastle overlooking the sae and the Pembrokeshire Coast. 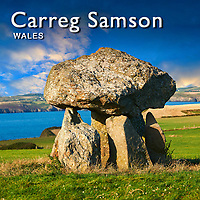 It is Carreg Samson 4.7 metres by 2.7 metres and 1.0 metre thick. Carreg Sampson’s capstone is 4.5 metres long by over 2.7 metres wide sits on three of the seven upright supporting stones. Scholars believe that the Carreg Sampson chamber may have had a passage to it under the earth mound that would have originally covered it.